An award is a form of honour and S.P.S.E.C. 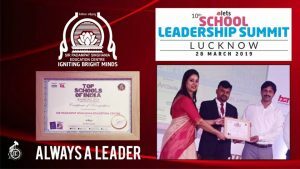 with its glorifying heritage of excellence has revived its distinction by hoisting the flag of unprecedented success of being a leader among the top schools by winning the ‘Top Schools of India Ranking 2018 ‘ award at the 10th School Leadership Summit 2019 at Hyatt Regency, Lucknow . The school is a pre- eminent centre in the country spawning future leaders with a global perspective and aiming at skilling the scholars through high impact learning strategies. The award is rewarded as a recognition for the school’s exemplary work in the field of education and for being featured in digital Learning Top School Ranking 2018.Ms. Bhawna Gupta, the Officiating Principal of the school was the proud recipient of this award. As one of the key speakers in the ceremony, she shared her expertise and proficiency in the field of education during the session – “How are physical Education and Sports Essential to the Health and Development of a student? “.